When Rams rookie kicker Greg Zuerlein kicked a 53-yarder to send Sunday’s game against San Francisco into overtime and then nailed his 54-yarder to win it late in overtime, Greg “The Leg,” became the first kicker in NFL history to send a game into OT with a 50-plus yard kick and then win a game in the fifth quarter with a make from a similar distance. 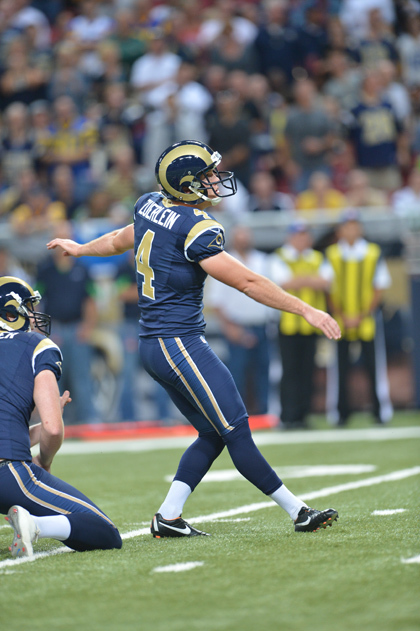 Zuerlein has kicked seven field goals from 50-plus yards this season. He’s also missed four times from beyond 50 yards but his percentage is one the most successful for long distance kickers in league history. If Zuerlein hits one more 50+ yarder, he’ll tie Morten Anderson and Jason Hanson for the most in a season in NFL history. His two on Sunday allowed him to pass the previous franchise record of six held by Josh Brown and Tony Zendejas.